21 Day Program - LEARN. PRACTICE. MASTER. BEGIN AGAIN. ​LEARN. PRACTICE. MASTER. BEGIN AGAIN. ​a balanced and fulfilled life. do it all over again as soon as possible!! Linn not only sharpened my dog training skills but I learned so much about myself in the process....after all, I was learning from the master!!" Dog training does not exist in this program. 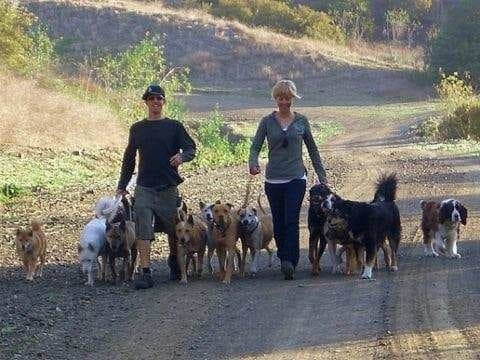 ​Like Cesar says, "Energy 1st, Dog Psychology 2nd, and then Dog Training." During your attendance, you will be a part of the rehabilitation process of the many dogs participating in this program. Linn will share with you his system and help you design a rehabilitation program to fit your business model and lifestyle. ​--This highly exclusive course is held twice per year, with openings for 10 students only. Candidates must complete a written application and submit the required video. Linn handpicks each student and the process is rigorous, including a personal interview. If you are interested in becoming a student for our 21 Day Training Program, please fill out the application below, email it to schoolofdogpyschology@gmail.com and we will contact you!